Complete customer solutions from Festo provide machine builders with a supply partner who can provide a modular, subsystem approach reducing bottle necks, build and delivery times. There is a growing trend towards ever smaller control cabinets, and control systems; remote I/Os and valve terminals from Festo are no exception. The modular control system CPX-E and the universal valve terminal VTUG are now combined into one solution package to address this need. Designed with this in mind the new CPX-E modular control system delivers flexible, compact control, coupled with high levels of compatibility. The universal valve terminal VTUG has been specially designed for installation in control cabinets. 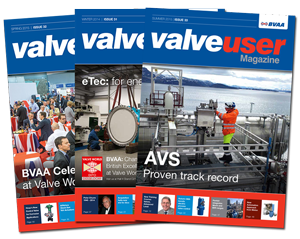 Special adaptations include a new manifold rail variant, check valves and fixed flow restrictors, make the valve terminal a true all-rounder in control cabinets. The topic of �simple installation� is self explanatory: the installation of the valve terminal in a control cabinet wall with the new manifold rails means that tubing within the control cabinet is unnecessar, drastically reducing cabinet machining time, build time and assembly costs. The design ensures the status indicator LEDs are forward facing in a cabinet layout along with inscription labels and manual overrides all to make commissioning and fault finding faster and more convenient. The practical hot-swap function allows individual valves to be replaced quickly during operation without the whole valve manifold having to be depressurised, which could disrupt other actuators and result in wasteful production downtime. The whole assembly is very compact reducing cabinet costs and footprint. 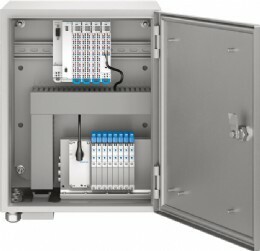 The modular control system CPX-E consists of individual function modules which enable a flexible, modular design: depending on the module combination, the system can be configured as a purely remote I/O system with bus module or as a control system with intelligent local control unit. The CPXE�s distinguishing features are its rapid signal processing and its compact assembly. Specifiers can select from control, bus, input/output and IO-Link master modules. The CPX-E control system meets the interference immunity requirements in accordance with NE21 for process and laboratory control. The CPX-E is an exciting new option for small machine and station level control. 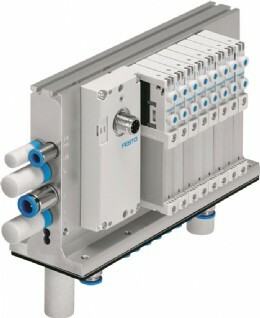 Within a small, economic form factor it provides modular, powerful and highly integrated connectivity to the actuator / sensor level. 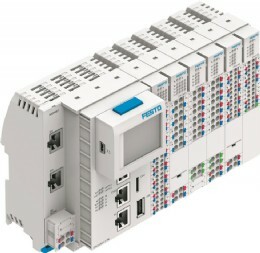 Bringing together the CPX-E control and VTUG valve terminal combines electrics and the highly competitive process valve controller package for self-assembly or complete cabinet build by Festo - a powerful combination for more compact and cost-efficient control cabinet solutions. The ability to respond quickly and efficiently to rapidly changing customer demands is a key consideration in factory and process automation applications. Complete customer solutions from Festo provide machine builders with a supply partner who can provide a modular, sub-system approach reducing bottle necks, build and delivery times.